BERKLEY, MI--(Marketwire - February 15, 2010) - For people who have special dietary needs, Michigan gourmet grocer Westborn Market understands how time consuming reading labels and checking store shelves can be. "Nearly two years ago we started carrying more gluten-free products after receiving a number of customer requests," said Rob Henry, assistant manager of Westborn Market's Berkley store. Gluten is the protein part of wheat, rye, barley, and other related grains. Henry also shared his own increased awareness about gluten-free foods since a family member had been diagnosed with a medical condition that requires a gluten-free diet. 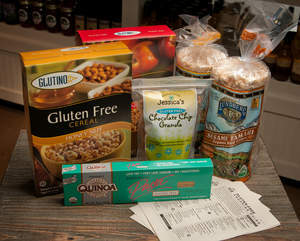 To help consumers on a gluten-free diet, Westborn Market recently created a "Gluten-Free Shopping Guide" that is available in an easy-to-download and print format in the Grocery section of the store's Web site, www.WestbornMarket.com. Free shopping-guide brochures are also available near the entrance and check-out areas of each store. The guide includes a list of items such as baking ingredients, breads, broths, cereals, condiments, cookies, dairy products, ethnic foods, grains, pastas, salad dressings, and soups, among other products. Meats, dairy products, fruits, vegetables, nuts and seeds without additives are naturally wheat and gluten free. "We try to make all of the products listed in our guide available in each store," added Henry. "If customers can't find a product they need, we'll do our best to find it and stock it on our shelves." Westborn Market has stores in Dearborn, Berkley and Livonia. Regular business hours are 9 a.m. to 9 p.m. Monday through Friday, 8 a.m. to 9 p.m. on Saturday, and 8 a.m. to 7 p.m. on Sunday. Location information, online ordering and store specials are available at www.westbornmarket.com or by calling 313-274-6100.